This book is the follow up to the bestselling book that Nancy wrote with Charles Colson entitled, “How Now Shall We Live?“. Total Truth is a kind of magnum opus for Nancy Pearcey who has spent many years writing essays on the topics of Science and Philosophy. 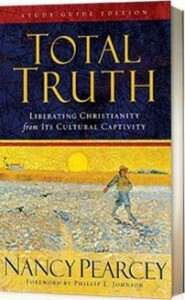 Total Truth sets out to answer the following question, “Does Christianity have a legitimate role to play in the public realm of politics, business, law and education?” She delves into the notion of the Sacred/Secular Dichotomy, which relegates civic matters to the secular sphere and religious matters to the private sphere of personal experience. This split has created a whole generation of schizophrenic Christians who try to balance their personal religious “faith” which includes church on Sunday and prayers at meals, with the entire rest of their life (which is largely dominated by anti-Christian philosophies and practices). The goal of this book is integrity and cohesiveness in our worldview. Nancy provides a wonderful historical background to the ideas she discusses, giving strong evidence from reason, scripture and historical evidence that the Christian faith cannot be contained to merely a private, personal expression. It must work its way into every area of life. If you like Chuck Colson or Francis Schaeffer (she was a student at L’Abri in Switzerland as a teenager), you are going to really enjoy and benefit from this book. As a final note, Nancy proves beyond any doubt that women can be power-house intellectuals. Thanks Nancy for such a great book. On a scale of 1-5, I’d give this a 4.0 overall. Thanks for the review, i aint read the book yet but would you say this is info that EVERY christian should know? Should this be taught in our local chuches?